The holiday season begins this weekend in Cherry Hill with Holiday House 2013, through Sunday at the Barclay Farmstead. This year, the Friends of Barclay extend a warm "Williamsburg" welcome to visitors, decorating the house in traditional colonial style with elegant flourishes and simple candlelight. While you're there, shop the Museum Shop for holiday gifts made by local craftspeople. Holiday House is free to attend, but a $2 donation at the door is appreciated. Holiday House runs until 9 p.m. tonight, then reopens from 10 a.m. to 5 p.m. Saturday and noon to 5 p.m. on Sunday. Click here to read more about this year's event in the Courier-Post. Barclay Farmstead is located at 209 Barclay Lane. For more information, call (856) 795-6225, or e-mail FarmsteadPrograms@yahoo.com. Cherry Hill Township will welcome the holiday season as a community at the annual Holiday Lighting Ceremony, at 6:30 p.m. this Monday, Nov. 25, in the Carman Tilelli Community Center. Council and I will be joined by area youth choirs as we light the Township’s official Hanukkah Menorah and Christmas tree. This free event is open to all residents, and includes light refreshments. For details, call (856) 488-7868, or e-mail events@chtownship.com. This past Sunday, hundreds of residents turned out to recycle unwanted items and a special Electronic Waste Recycling and Shredding Day at the Katz JCC. Sponsored by the Township in partnership with Sustainable Cherry Hill and the Jewish Federation, Sunday's event collected 8,500 pounds of unwanted electronics and 22 tons of paper to be shredded and recycled. Thank you to our partners at Sustainable Cherry Hill and the Jewish Federation for their help in organizing the event. Council and I were proud to honor these community stakeholders, along with Chris Higgins from ou r Public Works Department, for their collective roles in helping to promote recycling in Cherry Hill ahead of America Recycles Day on Nov. 15. 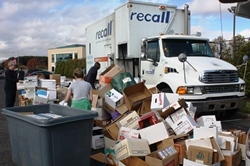 I also want to thank Recall and E-Force Recycling for helping to recycle the vast amount of materials we collected! And remember: If you couldn't make it out last weekend, you can deposit your e-waste (including TVs and computer monitors) 24 hours a day, 7 days a week at the Department of Public Works, 1 Perina Blvd. For more information, please call (856) 424-4422. DPW will begin the second round of curbside leaf collection across Cherry Hill on Monday, weather-permitting. Neighborhoods scheduled for collection next week are: Colwick, Barlow, Woodland, Ridings of Fox Run, Charleston Woods, Charleston Riding, Brookmead, Woodcrest, Erlton South, Kingsway Village, Cooper Park Village, Erlton North, Hinchman, Lucerne, Sienna, Voken Tract. Please avoid parking cars in the street on scheduled leaf-collection dates, and be sure to remove branches, twigs and other debris from leaf piles to ensure they can be collected. For more information, including the full leaf collection schedule, click here, or call DPW at (856) 424-4422. The State of New Jersey has extended the deadline for filing Homestead Benefit applications to Tuesday, Dec. 31. The deadline had originally been set for today. The Treasury Department's Division of Taxation has mailed applications to more than 1.3 million homeowners this year. Benefits will be calculated based on calendar year 2012. To qualify, you must be a New Jersey homeowner who owned a principal residence on Oct. 1, 2012, and paid property taxes on that home. You must also have reported $75,000 or less in New Jersey gross income for 2012, or $150,000 if you were 65+ or disabled. For more information, call the Division of Taxation's Homestead Benefit Hotline at (888) 238-1233 from 8:30 a.m. to 5:30 p.m. Monday-Friday, or click here. Text telephone service for the hearing-impaired is available at (800) 286-6613 or (609) 984-7300. 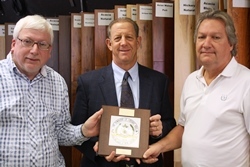 As we continue to honor some of Cherry Hill's oldest businesses, I'd like to recognize Camden Flooring -- another one of Cherry Hill's longest-standing establishments. Camden Flooring moved to Camden shortly after the opening of the Ben Franklin Bridge in 1926. A few years later, in 1932, the flooring company moved down the road to Cherry Hill. Its owners, the Sweigart Family, made their home right here in Cherry Hill, and today, brothers Rob and Steve Sweigart continue to run the company. With the help of the Cherry Hill Historical Commission, we have identified many businesses that are 50 years or older, and I will be visiting each of them in the near future to recognize their longevity. During the next several weeks, I want to highlight each of these businesses individually. Each of these businesses has become a living piece of Cherry Hill’s history, and I’m honored to be able to recognize their longstanding investment and presence in our community. Click here to read about this project in the Courier-Post; if you know of a business that has been around for 50 years or more, please let us know by calling (856) 488-7878, or e-mailing me at MayorCahn@chtownship.com. The holiday season begins this weekend in Cherry Hill with Holiday House 2013, through Sunday at the Barclay Farmstead. This year, the Friends of Barclay extend a warm "Williamsburg" welcome to visitors, decorating the house in traditional colonial style with elegant flourishes and simple candlelight. While you're there, shop the Museum Shop for holiday gifts made by local craftspeople. Holiday House is free to attend, but a $2 donation at the door is appreciated. Holiday House runs until 9 p.m. tonight, then reopens from 10 a.m. to 5 p.m. Saturday and noon to 5 p.m. on Sunday. Click here [http://www.courierpostonline.com/article/20131119/LIVING02/311190005/Step-back-time-Barclay-Farmstead-s-holiday-house-honors-American-history] to read more about this year's event in the Courier-Post. Barclay Farmstead is located at 209 Barclay Lane. For more information, call (856) 795-6225, or e-mail FarmsteadPrograms@yahoo.com. Cherry Hill Township will welcome the holiday season as a community at the annual Holiday Lighting Ceremony, at 6:30 p.m. this Monday, Nov. 25, in the Carman Tilelli Community Center. Council and I will be joined by area youth choirs as we light the Township’s official Hanukkah Menorah and Christmas tree. This free event is open to all residents, and includes light refreshments. For details, call (856) 488-7868, or e-mail events@chtownship.com [mailto:events@chtownship.com] . This past Sunday, hundreds of residents turned out to recycle unwanted items and a special Electronic Waste Recycling and Shredding Day at the Katz JCC. Sponsored by the Township in partnership with Sustainable Cherry Hill and the Jewish Federation, Sunday's event collected 8,500 pounds of unwanted electronics and 22 tons of paper to be shredded and recycled. Thank you to our partners at Sustainable Cherry Hill and the Jewish Federation for their help in organizing the event. 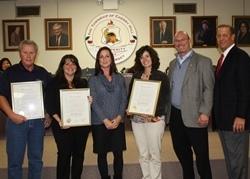 Council and I were proud to honor these community stakeholders, along with Chris Higgins from our Public Works Department, for their collective roles in helping to promote recycling in Cherry Hill ahead of America Recycles Day on Nov. 15. DPW will begin the second round of curbside leaf collection across Cherry Hill on Monday, weather-permitting. Neighborhoods scheduled for collection next week are: Colwick, Barlow, Woodland, Ridings of Fox Run, Charleston Woods, Charleston Riding, Brookmead, Woodcrest, Erlton South, Kingsway Village, Cooper Park Village, Erlton North, Hinchman, Lucerne, Sienna, Voken Tract. Please avoid parking cars in the street on scheduled leaf-collection dates, and be sure to remove branches, twigs and other debris from leaf piles to ensure they can be collected. For more information, including the full leaf collection schedule, click here [http://www.cherryhill-nj.com/CivicAlerts.aspx?AID=402] , or call DPW at (856) 424-4422. The State of New Jersey has extended the deadline for filing Homestead Benefit applications to Tuesday, Dec. 31. The deadline had originally been set for today. The Treasury Department's Division of Taxation has mailed applications to more than 1.3 million homeowners this year. Benefits will be calculated based on calendar year 2012. To qualify, you must be a New Jersey homeowner who owned a principal residence on Oct. 1, 2012, and paid property taxes on that home. You must also have reported $75,000 or less in New Jersey gross income for 2012, or $150,000 if you were 65+ or disabled. For more information, call the Division of Taxation's Homestead Benefit Hotline at (888) 238-1233 from 8:30 a.m. to 5:30 p.m. Monday-Friday, or click here [http://www.cherryhill-nj.com/admin/www.state.nj.us/treasury/taxation/homestead/geninf.shtml] . Text telephone service for the hearing-impaired is available at (800) 286-6613 or (609) 984-7300. With the help of the Cherry Hill Historical Commission, we have identified many businesses that are 50 years or older, and I will be visiting each of them in the near future to recognize their longevity. During the next several weeks, I want to highlight each of these businesses individually. Each of these businesses has become a living piece of Cherry Hill’s history, and I’m honored to be able to recognize their longstanding investment and presence in our community. Click here [http://www.courierpostonline.com/article/20131114/BUSINESS20/311140020/Cherry-Hill-honors-businesses-town-50-years] to read about this project in the Courier-Post; if you know of a business that has been around for 50 years or more, please let us know by calling (856) 488-7878, or e-mailing me at MayorCahn@chtownship.com [mailto:MayorCahn@chtownship.com] .